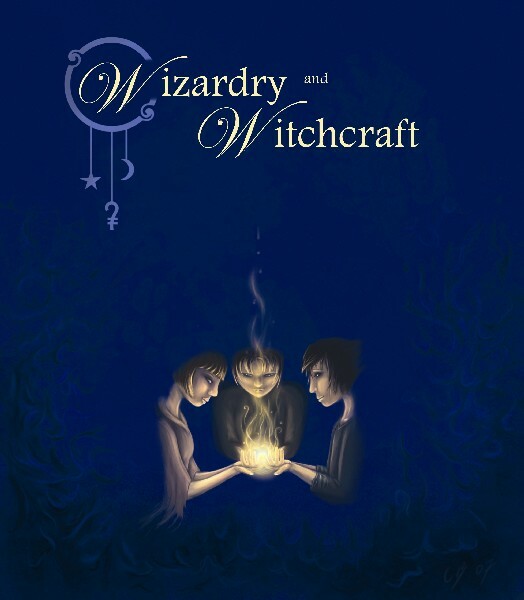 Wizardry and Witchcraft by Daniel Armyr is a Harry Potter role playing game, an unlicensed Harry Potter role playing game. It gives credit to the works of Rowling’s, but avoids using specific terms and names used in them. No mention of Hogwarts, just magical schools in general etc. It was released a few years ago and can be downloaded for free. As I understand it there were physical books at one time, but they since long sold out. The electronic version of the game is a full color 127 page PDF, richly illustrated by Ayne Greensleeves, Jamie Poitra and others. There are wide margins on the pages, and large fonts in all the headings, the game is a quick read. The reader is assumed to be familiar with the Harry Potter books/movies, and there is not much real setting info in the game, except for a pretty nice chapter on the nature of magic. The game allows for both student and adult characters, but the focus in on the former. The game uses a d12 for all mechanics (the common die+attribute+skill against difficulty). The nine attributes are divided into a matrix with the areas of Physical, Mental and Social on one axis and the styles Crude, Efficient and Fancy on the other. I have not seen this anywhere else, and think it is pretty neat. Each character has a few Virtues (good stuff) and Vices (bad stuff) to give some extra color and bonuses. The magic rules are simple and follow the same principle as skill use, there are spell lists with assigned difficulties in the game. Also the players are encouraged to invent a few spells of their own during character generation. All together a pretty light set of rules, that look a bit like the WoD rules on the surface, but without the dice pools. The game does not say very much about form. There is a GM called Storyteller, and there are players who play wizards and witches. The players are encouraged to keep track of actions that their characters are proud of or ashamed of, but I could not find any rules linked to those records. The setting is weak, but if everyone is familiar with the source materials it should not be a problem, it’s easy to fill in the gaps. The rules are good, if you want a traditional rules light game. Less so if you want the rules to model the development of the characters or the story in the source material. Still, if you want a more rules light engine for your WoD game you could pretty much take your character sheets as they are and start using these rules instead. The form is weak, or nonexistent if you will. As you can see above I am not all that impressed by the game, but it is not a bad game, just not something I could see myself running. If you want a rules light traditional Harry Potter RPG you could definitely do worse than picking up Wizardry and Witchcraft. wizardryandwitchcraft.sverok.net – The Wizardry and Witchcraft site where the game can be downloaded. I got into a discussion with Jimmy Peggie about preamps for the Ergo gamba and piezo pickups in general. In the end I promised to record a sample with and without a preamp made for acoustic instruments. Sample 1 First I connected the gamba directly to my LEM rdx 82u mixer. The mixer has USB out and acted as A/D converter, I did the recordings in Audacity on the computer. Sample 2 Then I connected a Behringer V-Tone Acoustic ADI 21 preamp between the gamba and the mixer. Sample 3 Just for fun I connected my Behringer Virtualizer PRO between the preamp and the mixer. This is the setup I usually have when playing. The method of the test is questionable, I pretty much used the settings on everything that happened to be dialed in when I started, very little adjustments took place. No doubt I can tweak a better sound on all setups. But I did not have the time for that this time. I might get back to this project later and redo the recordings when I have a bit more time on my hands.